In the #1 New York Times bestselling novel Wonder, readers were introduced to memorable English teacher Mr. Browne and his love of precepts. Simply put, precepts are principles to live by, and Mr. Browne has compiled 365 of them—one for each day of the year—drawn from popular songs to children’s books to inscriptions on Egyptian tombstones to fortune cookies. His selections celebrate kindness, hopefulness, the goodness of human beings, the strength of people’s hearts, and the power of people’s wills. Interspersed with the precepts are letters and emails from characters who appeared in Wonder. Readers hear from Summer, Jack, Charlotte, Julian, and Amos. 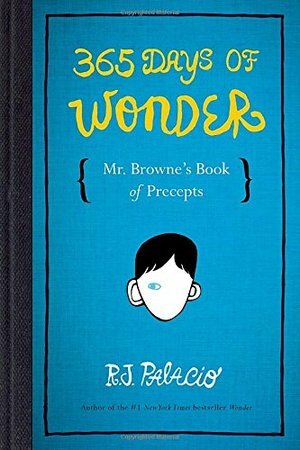 There’s something for everyone here, with words of wisdom from such noteworthy people as Anne Frank, Martin Luther King Jr., Confucius, Goethe, Sappho—and over 100 readers of Wonder who sent R. J. Palacio their own precepts.